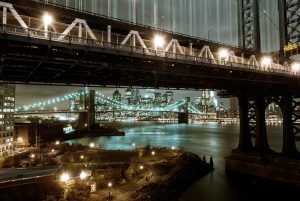 The Manhattan and Brooklyn bridges from the district of Dumbo at night in the city of NYC. Dumbo is a district of Brooklyn. It is connected to Manhattan Island by the Manhattan and Brooklyn bridges. At night, the city and the bridges twinkle light. Dumbo est un quartier de Brooklyn. Il est relié à l’île de Manhattan par les ponts de Manhattan et de Brooklyn. De nuit, la ville et les ponts brillent 1000 feux.